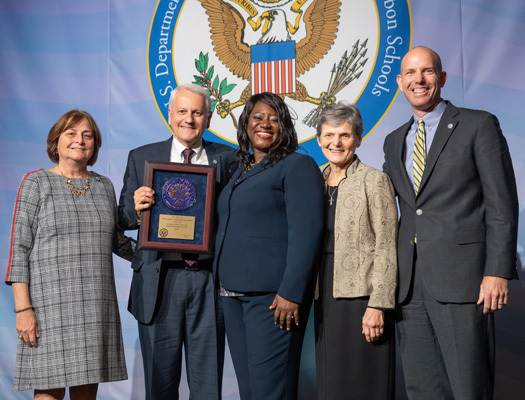 ON THE NATIONAL STAGE: Ms. Aba Kumi (center), Director of the U.S. Department of Education's Blue Ribbon Schools Program, presents the Blue Ribbon plaque to Principal Mr. Joseph A. Waler during the awards ceremony in Washington, DC, on November 8. Joining Mr. Waler on stage are Science Department Chairperson Miss Maureen Wahl (left), Past President Sister Jacquelyn Gusdane, and President Dr. Michael Bates. Nearly 60 members of our faculty and staff traveled last week to Washington, DC, to celebrate Notre Dame-Cathedral Latin's National Blue Ribbon Award. U.S. Secretary of Education Betsy DeVos saluted the administrators and teachers of Blue Ribbon schools on their accomplishment and urged them to use their national recognition to fuel even greater achievement and innovation in their communities. 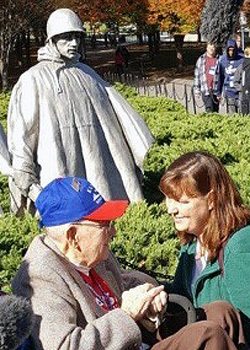 THANK YOU FOR YOUR SERVICE: Sister Michelle Kelly, Director of the Academic Success Center, chats with a veteran at the Korean War Memorial during NDCL's Blue Ribbon Celebration Tour last week. "Excellence is not a destination," she stressed. "Keep rethinking school and questioning everything." During their Blue Ribbon Celebration Tour of the nation's capital, members of the NDCL group visited numerous museums, memorials, and historic sites, including the U.S. Capitol, Smithsonian Institution, Jefferson Memorial, Library of Congress, Newseum, Franklin Delano Roosevelt Memorial, Martin Luther King Memorial, World War II Memorial, Korean War Memorial, Holocaust Museum, and African-American History Museum. They also prayed together during a Mass of Thanksgiving at the National Shrine of the Basilica of the Immaculate Conception. "Throughout the trip, I think we realized how we've all worked together to reach this significant moment for our school," explained Principal Mr. Joseph A. Waler. "And we continue to appreciate how blessed we are to be called together at this point in our lives and careers to provide the finest Catholic education for the 704 students we are so blessed to serve."